The founding brewmaster behind Blue Moon beer has a new beer that delivers a different kind of buzz. Keith Villa, who invented Blue Moon Belgian Wheat more than two decades ago, next month will launch the first beer from new venture CERIA Brewing Co. But Grainwave Belgian-Style White Ale will be quite different than Blue Moon. For starters, the beverage has no alcohol and includes 5 milligrams of THC, the high-producing ingredient found in cannabis plants. Made with blood orange peel and coriander, the ale "has a richer, deeper orange character and a little different type of bitterness because of the cannabinoids," Villa said. Grainwave Belgian-Style White Ale will initially be available in Colorado in mid-December. But Villa hopes to expand its distribution to California and Nevada soon. Cannabis-infused beers have become trendy, but so far none released in the U.S. have THC. They typically have hemp, which gives them a taste similar to marijuana. Federal law prohibits brewers from using marijuana in beer. But CERIA's beverage doesn't contain alcohol, so it technically isn't a beer. Signs of interest in the marijuana-beer business include Molson Coors' deal, announced in August, to work with Canadian cannabis company The Hydropothecary Corp. to develop non-alcoholic marijuana drinks for the Canadian market. And Constellation Brands, maker of Robert Mondavi wine, Corona beer and Svedka vodka, last year invested $4 billion in Canopy Growth, a Canadian marijuana firm, with cannabis drinks among future plans. Villa started Ceria in January after he officially retired from Blue Moon after 32 years. His wife, Jodi Villa, is a civil engineer, and the CEO of the company in Arvada, Colorado, a northwest suburb of Denver. Colorado legalized recreational marijuana four years ago and Villa became interested in its benefits. "I quickly found that there was a lot of anecdotal evidence, as well as some conclusive evidence that marijuana had some good things about it," Villa said. "I did research and found you could brew with it and you could have beers that taste actually like beers but you have the effects" of marijuana, without smoking it, he said. 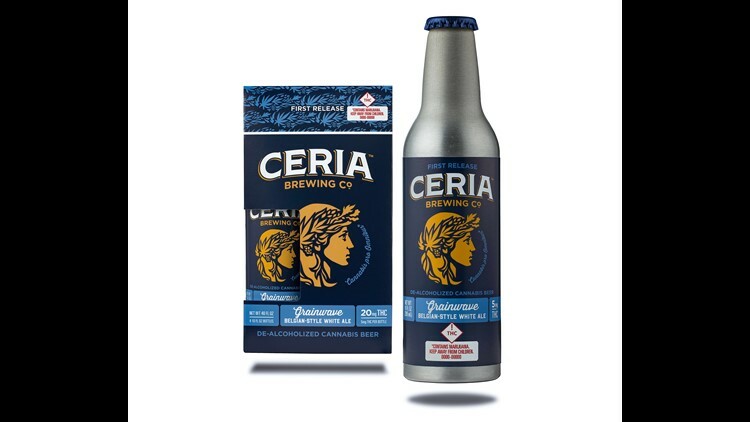 CERIA's first beer, the Belgian white, will be available in individual bottles (64 calories per bottle) costing about $9; four-packs will cost less than $36. The brewery plans to release an American Light Lager with 2.5 milligrams of THC and an India Pale Ale with 10 milligrams during the first three months of 2019. "The 2.5mg light beer, they can drink several of them and not get stoned, they will feel a little buzz and be happy," Villa said. "The medium level one they can have a couple and start to feel it and the high level one, they can have one and start to feel it, just like (with) an Imperial IPA." The company is also looking at other cannabinoids that, while not high-producing, may relieve anxiety or promote bliss. That's territory being explored with the chemical CBD, another chemical found in hemp and marijuana, which does not produce a high, but can be used to relieve pain and anxiety. "First we will focus on THC and we will gradually start to introduce some as the science starts to solidify around them and shows that they are safe," he said. The cannabis market will likely expand as several states voted to expand marijuana usage with Michigan voters opting to legalize recreational marijuana use, while Utah and Missouri voted to legalize medical marijuana. North Dakota rejected a measure to legalize marijuana. That's in line with CERIA's slogan "Cannabis Pro Omnibus," or "Cannabis for All." "It's starting to become a movement," Villa said. "We feel we are at the forefront."